Klara and the rest of the Diet Doctor family wishes you a very Merry Christmas. 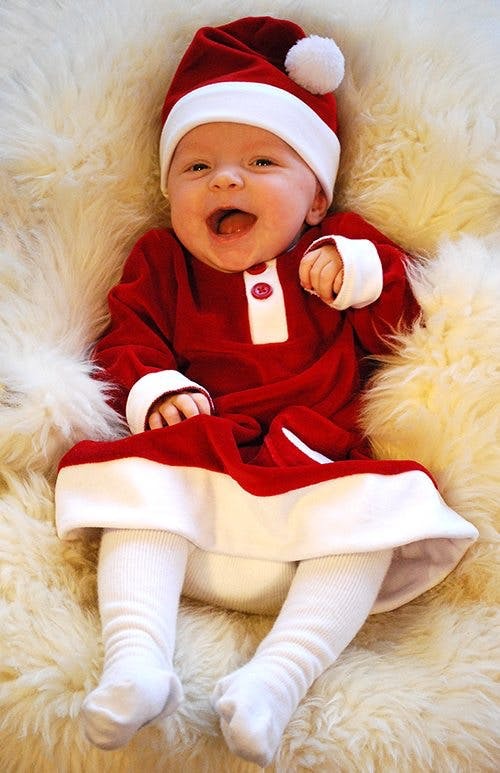 Merry Christmas to you too and cute baby! Oh, how gorgeous! Happy Christmas Andreas and family, and all the best for 2012. I love the toothless smile! Happy Holidays. So adorable! The toothless grin is precious! Oh my goodness she is darling! Merry Christmas to you all! Right back at you. Wow., What a darling baby girl! We're looking forward to our first LCHF Christmas with stuffing made from flax bread and turkey and smashed cauliflower with cheese. What a beautiful bundle of joy! Merry Christmas to all of you. A very Merry Christmas and a Happy, Peaceful and Prosperous New Year to you all. Very best wishes to you all from Geoff in UK. Such a darling and happy baby. It is so obvious she is well taken care of and so loved.